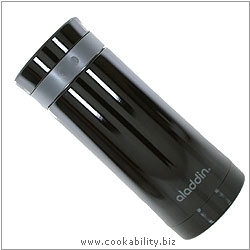 A simple and innovative travel flask that allows you to brew your tea or coffee directly in the flask. It will keep hot for up to 6 hours. Stainless steel vacuum insulation. Leakproof lid. BPA Free. Cafetiere plunger is removable, which leaves just the tea filter in situ.